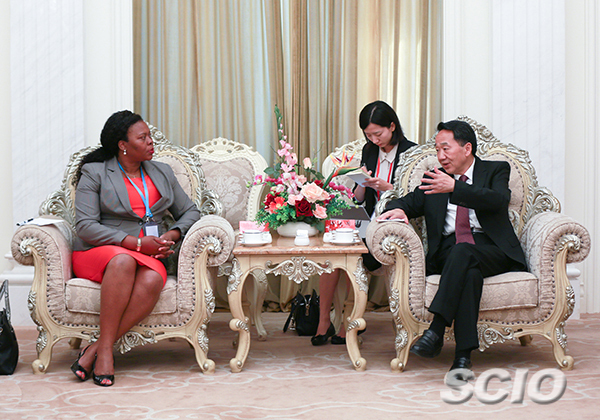 Jiang Jianguo met with a Mozambican media delegation in Beijing on Tuesday. Jiang Jianguo, deputy head of the Publicity Department of the Communist Party of China (CPC) Central Committee and minister of the State Council Information Office, met with a Mozambican media delegation headed by Emilia Jubileu Moiane, director of the Information Office of Mozambique, in Beijing on Sept. 5. The two sides agreed on enhancing media exchanges and expanding pragmatic cooperation to deepen mutual understanding between the two peoples.